Explore damage prevention information, local contacts and rules for safe digging in Rhode Island. 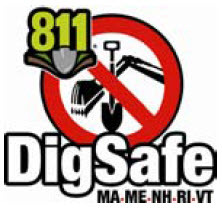 Rhode Island Dig Safe System, Inc.
Information not made available to CGA. To supply updated information, contact us. To promote underground facility safety through training efforts in cooperation with Dig Safe®, underground facility owners, private locating companies, municipalities, excavators and regulatory agencies, and to continually evaluate the New England one-call laws and underground safety best practices.